Last summer, George and I were the victims of identity theft. Almost 16 million people a year are hit by this crime, but when it happens to you, it's just...icky. The thought that someone is using your name and personal information to steal from you is an awful feeling. As we worked ourselves out of the ID Theft hole, I found lots of resources online, but no step by step list of what to do. I hope it never happens to you, but if it does, read on. We don't know for sure how the thief got our information (my hunch: Equifax breach). "Marlene McCool" then proceeded to use that information to go online and file a fraudulent change of address with the US Postal Service. Once that was done, she began opening multiple credit cards in our name, hoping they would be forwarded to her. I was alerted when we didn't get mail for three days, a rare occurrence for us. Just as I began to get suspicious, my husband received a call from AmEx to verify information for a new card that was being opened. The next day we received a postcard in the mail, confirming that we had forwarded our mail to Texas. Nope. Unfortunately it came a little late, as our mail had already been heading south for four days. We put a stop to that right away, but about a week later the new credit cards started rolling in. Each one contained a card with my husband's name, and one for our new friend, "Marlene McCool". Luckily we caught on quickly, and didn't lose any money. But handling ID Theft, and making sure your credit isn't affected, takes lots and lots of time. Even though it happens to so many, it's hard to know where to begin. Here's what we did, step by step, with links to a few websites that can help. 1. Contact your bank, credit card companies, and any other financial institutions. Sadly, they hear this every day, and will put a note on your account to watch out for suspicious activity. Some even had us add an additional level of password protection or a code word. 2. Contact one of the three main credit reporting agencies - TransUnion, Experian, or Equifax and set a fraud alert. Obviously, I did not call Equifax. Ask for either a credit hold or credit freeze be put on your account. A hold is free, and lasts for 6 months. If someone tries to open an account in your name, you are notified for further confirmation. A credit freeze is a higher level of protection, and lasts until you remove it. It also requires a fee to place it and another to lift it if you want to purchase something. The agency you call is required to contact the other two bureaus on your behalf. Finally, ask for a copy of your credit report so you can review it, which is free to you as a victim of ID Theft. 3. If you know where the breach came from, contact that source and find out how they would like you to proceed. In our case, we weren't sure where it started, but we knew that the US Postal Service was involved. Because they are Federal, we were able to open a criminal case with them for investigation. Go to the USPS website, scroll to "Postal Inspections" on the bottom, and then "Investigations". 4. 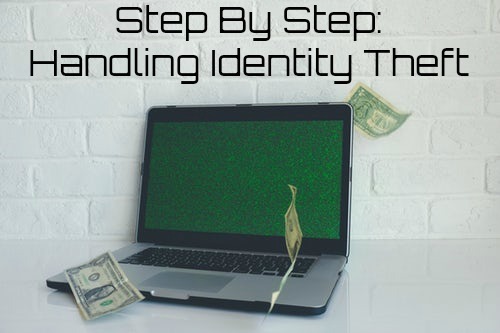 Set up an account with the FTC, through IdentityTheft.Gov. They will walk you through the process, and let you know if there are other agencies that should be notified, for example, if your social security number was breached. This is an important step because it can be used as proof of ID Theft if any accounts are opened in your name and you need to dispute them. If you lost money or property, you may need to file a police report with your local agency as well. 5. Immediately contact credit card companies or any new accounts that show up. Ask that the account be closed and their query removed from your credit report. This is an important step so that your credit score is not affected. Our ID Theft situation with "Marlene McCool" was handled within a few months, and so far we've had no long lasting problems. I'm hoping that she gave up because we caught on to her so quickly. But because I'm paranoid, I'll probably continue to monitor everything forever. Better safe than sorry. This happened to us and I wish I’d had this list. Great, comprehensive list. Have a super weekend beautiful! Oh my goodness I am so sorry that happened to you, but I am glad there were no purchases or damage done to your credit! We've had fraudulent charges on our credit card a few times, but we have been lucky that our bank monitors very closely and we were not held responsible for them. Thanks for sharing these great tips! Our credit card gets compromised all the time - it's crazy, I have no idea how it happens but we get alerts from Chase asking if we're in Vegas! Ha! I've never been myself but some thief is using my credit card to have fun. Luckily they shut it down right away. Identity theft is so much more serious, I am so sorry that happened to you and George. I'm going to save this information! Have a wonderful weekend Marlene McCool, I mean Lana! Glad that they caught it!! I had that happen to me too and wish I had this to guide me!!! Identity Theft is the worst, it happened to my ex and his life was ruined for a long time. I’m so sorry to hear you and George also had to deal with this annoyance. I would never steal from people its so wrong and gross. Catching it quickly is a great thing, but it sounds like a serious nightmare. Thank you for all of the tips! I’m bookmarking this post. Don't you just want to punch some people? wtf is wrong with people? Stuff like this makes really dislike people. I'm glad you're sharing this super helpful resource but it's so sad to me that people need it. Like, honestly, it saddens me that some people don't care who they hurt. OMG. Marlene McCool wasn't so cool! Seriously shady. I appreciate this post because I think it will help many!